Pakistan Day is the national day of Pakistan that commemorates the Lahore Resolution of 1940 and the deceleration of the republic in 1953. It is celebrated on March 23. The Lahore Resolution was adopted by the All-India Muslim League during its general session held on March 22-24, 1940. The resolution demanded the division of British India and creation of two autonomous and sovereign states for Muslims. 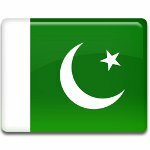 Pakistan became independent in 1947 as a federal Dominion within the British Empire. The Dominion of Pakistan ceased to exist on March 23, 1953, following the adoption of the Constitution. The country became a republic within the British Commonwealth, officially known as the Islamic Republic of Pakistan. The anniversaries of the Lahore Resolution and the 1953 Constitution were proclaimed as the country's national day. The Pakistan Day celebrations include a large-scale military and civilian parade held in Islamabad, the capital of Pakistan. The parade takes place early in the morning and is presided by the President of Pakistan. There also are wreath-laying ceremonies at the mausoleums of Muhammad Ali Jinnah and Muhammad Iqbal, the founder of Pakistan and the national poet of Pakistan correspondingly.